My Owners' Names: Nancy and Nils Anderson of Arcadia, Florida. 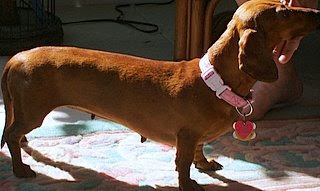 My Breed: I am a Dachshund girl; a tweenie, which is a mix of standard doxie and mini doxie. My Age: I am 4 years old. My Color: I have striking short red hair, which makes me stand out when I strut around town. My Weight: I weigh 9 little pounds. My Favorite Thing To Do: I love to take long walks with my mom and dad. It is great exercise for me and for them, too. My Pet Peeve: I dislike it when my mom and dad ignore me when I want to eat breakfast or supper. I enjoy eating and can get impatient. My Favorite Food: Dog food is OK, but I prefer people food. Wow, that stuff tastes so good! I wonder why dog food was invented when all this great people food is available. My Funny or Unusual Habit: I like to whine and whine in the early morning until I wake up everyone. This is how I get my mom and dad to spoil me. I get to go out for a short walk, come back in the house and snuggle with them under the covers at the foot of the big bed. My Best Quality: I love to snuggle and cuddle up next to people no matter where they are resting. I am always looking for an opportunity to snuggle. What Makes Me So Special: I am named after another Becky from many years ago. I was found walking down the street in a nearby town and was taken in by a rescue group. My former owner cared about me but apparently was unable to keep me. The people at the rescue group were nice, but it was hard to be left homeless. Then my new mom and dad came along, and my life is so wonderful because they give me lots of love, affection and attention. I was found to be heart worm positive, but my mom and dad are having me treated and I will soon be well. I am so happy to be in my new home with my mom and dad, and they tell me each day how grateful they are to have me. I am a lucky girl! SEND TO A FRIEND: Have family and friends who might enjoy seeing this profile? Send it to them by simply clicking on the e-mail icon directly below.